True Economics: 21/7/15: Central Europe's Lesson: Fixed Euro or Floating Exchange Rates? 21/7/15: Central Europe's Lesson: Fixed Euro or Floating Exchange Rates? The EU report on economic convergence of the Accession States of the Central and Eastern Europe (CEE10) makes for some interesting reading. Having covered two aspects of convergence: real economic performance and financialisation, lets take a look at the exchange rate regime impact on convergence. This is an interesting aspect of the CEE10 performance because it allows us to consider medium-term impact of euro on CEE10. Basically there were two regimes operating in the CEE10 vis-a-vis the euro: fixed regime (with national currency pegged to the euro) or floating regime (with national currency allowed to float against the euro). First, recall, that "out of the five CEE10 countries which have adopted the euro by 2015, four (i.e. Estonia, Latvia, Lithuania and Slovenia) already operated under fixed exchange rate regimes in 2004. In their case, euro adoption did not represent an essential regime change with respect to the role of nominal exchange rate flexibility in the convergence process vis-à-vis the EA12." Now, EU Commission would be slightly cheeky in making this statement, since while in the first order effect this is true, in the second order effect (expectations), this is not true - a peg to the euro could have been abandoned in a severe crisis, albeit less easily under the regime of ongoing financialisation of the CEE10 economies via foreign banks lending; however, once euro is adopted, no devaluation is possible even in theory. And this is not a trivial consideration, since policymakers know that should they mess up in the longer run, there will be a risk of peg abandonment, resulting in direct, transparent exposure of their policies-generated imbalances for all to see and in serious embarrassment vis-a-vis their European counterparts. In other words, the threat of devaluation as a feasible option could have actually acted, in part, to make peg regimes more stable. 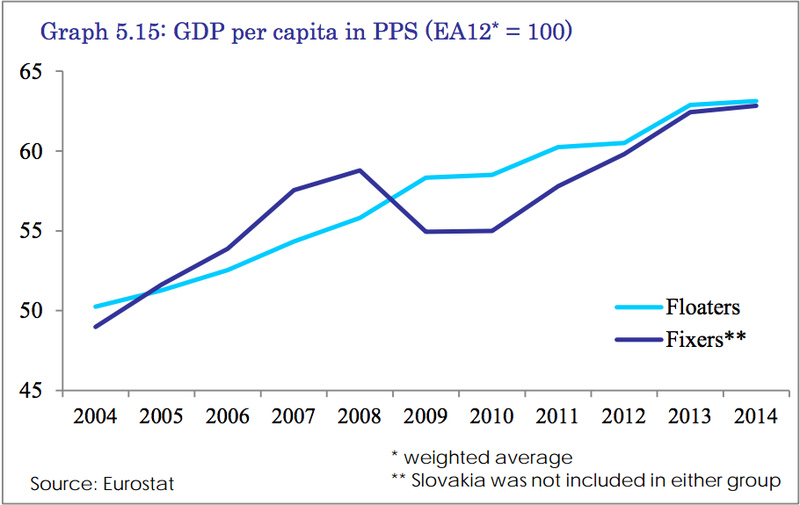 From EU own analysis: "Based on the GDP per capita in PPS data, there was no significant difference in the speed of real income convergence to the EA12 between fixers and floaters over the past decade, but there was a large degree of heterogeneity within both groups. Rather than the type of exchange rate regime, a more important relationship existed between the speed of catching-up and the initial income level, with less developed countries in general converging at a faster pace. Accordingly, the fastest growing economies were, among the fixers, the three Baltic countries and, among the floaters, Poland and Romania. 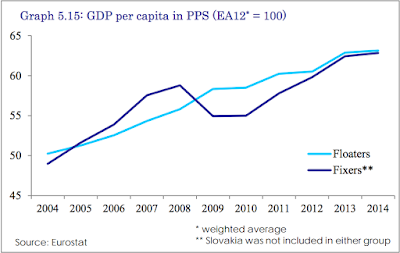 In addition, Slovakia, which recorded one of the best catching-up performances, floated its currency until euro adoption in 2009 and the bulk of its real convergence over the past decade actually materialised before 2009." What does this mean? That nature of growth during the period was similar for floating and fixed regimes: both were driven by catching-up of economies, most notably via capital investment. Being fixed to the euro or not, it appears, had no effect on rates of convergence. But, remember, euro is about stability, not growth. So the key test, really, is in volatility of convergence path, not the path itself. Per EU Commission: "The real convergence path of floaters was in general smoother than that of fixers. This was mainly due to the more pronounced economic overheating in the latter group prior to 2008, which then also led to a larger set back during the financial crisis." Oops… so staying closer to euro hurts. Having fixed rates, hurts. Bubbles got worse in countries with pegged rates. That is not exactly an endorsement of the euro-led regimes. There's a caveat: "Nevertheless, fixers were able to again largely close their GDP-gap to floaters by 2012, as they enjoyed an export-led recovery, supported by internal price adjustment, structural reforms and favourable export market developments." Yep, that's right: austerity and re-shifting of economy toward external sectors, rather than domestic demand is the miracle that allowed for the fixed rates regimes convergence. That, plus unmentioned, monetary policy activism. Still, the view of boom-to-bust euro-driven economy for the fixed rates regime remains. Not that the EU Commission will acknowledge as much. "The extent of price level convergence over the last decade mainly reflected differences in the speed of catching-up. That said, the average household consumption price level of fixers remained close to that of floaters until 2008, but it became significantly higher in the post-crisis period, as comparative prices of floaters fell." In normal English: deflation hit fixers, while floaters avoided it. Core conclusion (despite numerous caveats): "Floaters appear to have been in general able to benefit from their monetary autonomy to achieve a higher degree of price stability. In the pre-crisis period, faster growth and related overheating gradually drove up inflation in fixers significantly above the average inflation rate of floaters. Subsequently, larger output drops and the inability to depreciate against the euro implied that fixers generally also experienced more pronounced disinflation. From late-2010, inflation in the two groups developed quite similarly on average, but the variance was higher among floaters." So final note on interest rates. Remember - convergence of rates irrespective of risk is one of the poor outcomes of the euro introduction in the EA12, fuelling massive asset bubbles in Spain and Ireland, fiscal imbalances in Greece and so on. In CEE10: "Over the past decade the benchmark long-term interest rate on government bonds was higher on average for floaters than for fixers, both nominally and in real terms. This is partly a consequence of the higher average public debt level among the floaters, but to some extent it is arguably also related to more exchange rate uncertainty inherent in floating." EU Commission grumbling acceptance of reality is almost entertaining: "Generally, it takes longer to regain cost competitiveness via internal price adjustment [something that fixed rates economies are forced to do] than via nominal exchange rate depreciation [something that flexible rate economies have access to] and the initial shock to the real economy is more severe. However, the internal adjustment is more permanent as it requires a structural solution to the underlying problems, whereas the temporary boost generated by nominal exchange rate depreciation can actually postpone the reforms necessary for further sustained catching-up." You'd think that flexible exchange rate economies just can't ever compete with fixed rates economies. In which case we obviously have a paradox: Denmark and Switzerland vs Italy and Spain (or for that matter Belgium and France). So the core conclusion is simply this: things are complex, but having a peg to the euro looks more dangerous in crises and in bubbles build up stages, than running flexible exchange rates regime. Who would have guessed?..